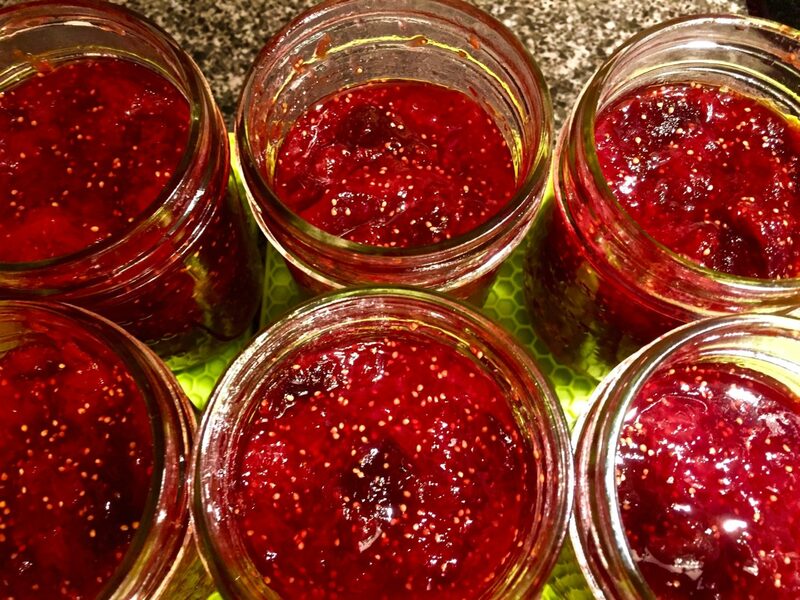 After the success of the Boozy Bourbon Vanilla Fig Jam, I was inspired to try another jam recipe also including a potent potable (Strawberry Grand Marnier Fig Jam). 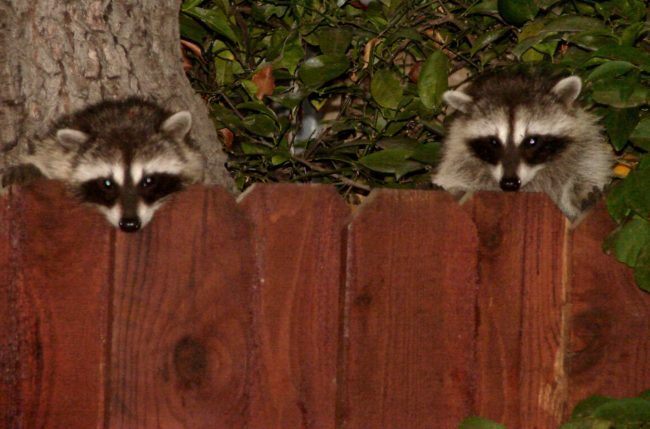 It was a good thing too because as I was making the jam, I looked out the kitchen window to see a family of raccoons helping themselves to all the fruit from the top of the tree! If they clean out the tree, this may be the last batch of fig jam I make this season. 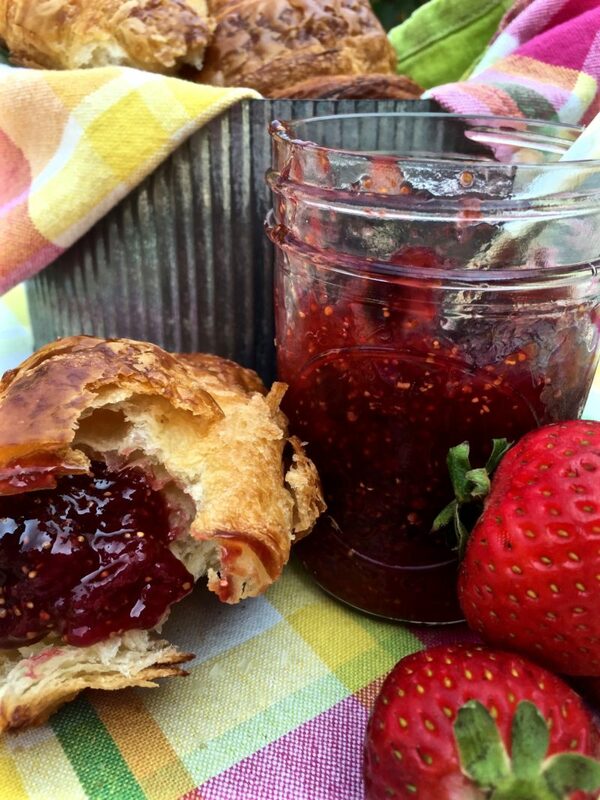 While researching strawberry jam recipes, many people mentioned that the jam sometimes would get foamy. I did not experience that, but if you do be sure to skim the foam off before putting it in the jars. I also read a good tip for determining when your jam is done. Put a couple of small plates in the freezer before you begin. When you think the jam is close to being done, put a teaspoon full of jam on the plate and run the spoon through it. If the jam runs back together, it is not yet ready. Once it stays in place, it’s good to go. 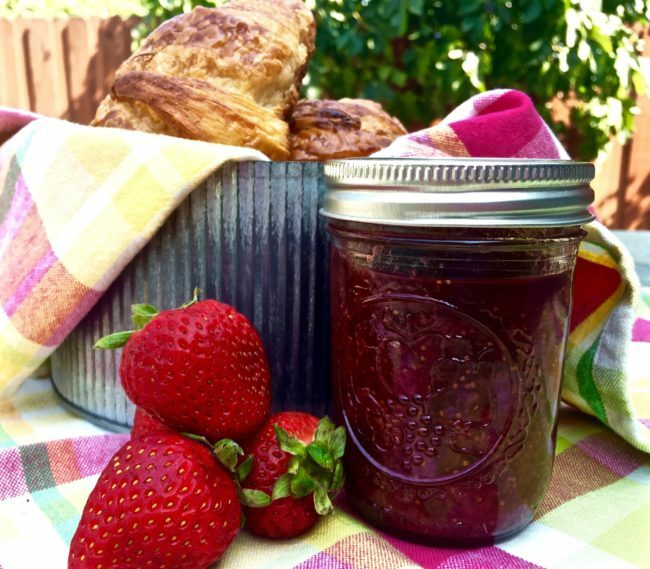 This jam was scrumptious on croissants, and I’m going to brush some over Tri-Tip next time we BBQ … ooh, maybe warmed up and spooned over vanilla ice cream…. endless possibilities! 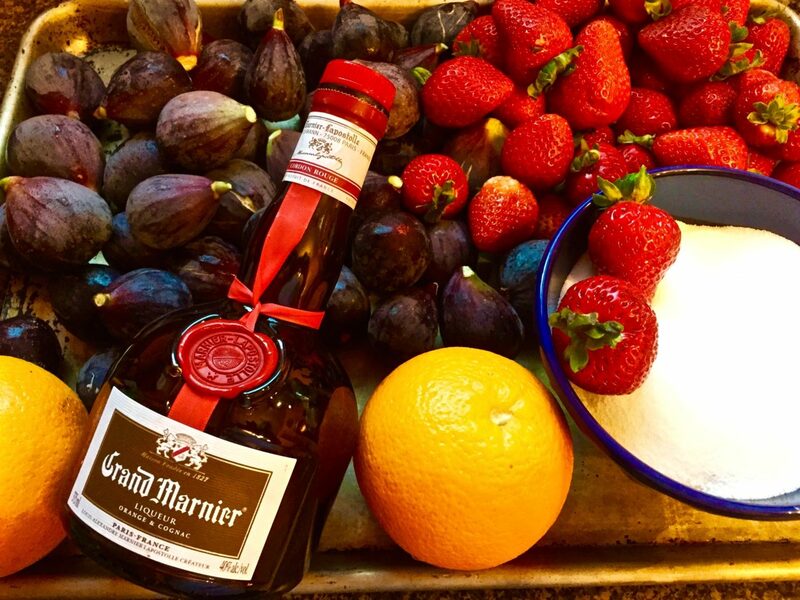 Combine the orange zest with 1 T. Grand Marnier in a small bowl and set aside to marinate. Combine all remaining ingredients in large pot and let macerate for 1 hour, stirring occasionally. Add the marinated orange zest. Bring fig mixture to a boil over medium-high heat. Reduce heat to medium and continue to boil until the jam thickens and is reduced by about half. Stir frequently and occasionally mash the mixture with a potato masher to crush the larger pieces. This took about an hour. Remove from heat. 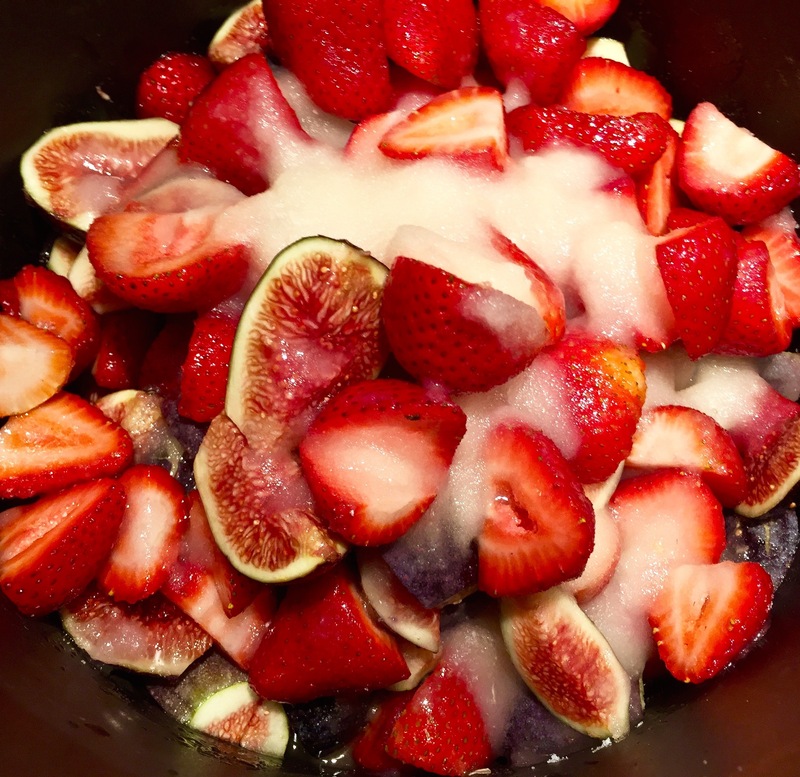 Once the fig mixture is almost done, boil your canning jars and lids in a large pot of water. Carefully remove from the hot water with tongs. 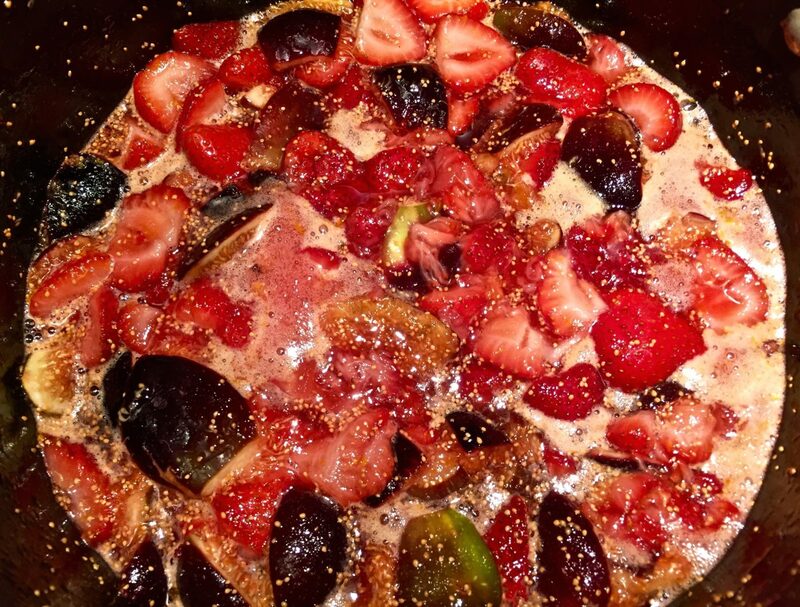 Ladle the fig mixture into the warmed canning jars leaving ¼” space at the top of the jars. Run a knife around the inside of the jars to remove any air bubbles. Wipe jar threads and rims with a clean damp cloth, so they don’t stick shut. Cover with hot lids; apply screw bands. Return the jars to the boiling water for 10 minutes. Carefully remove from water and let cool completely on the counter with a rack or towel underneath. Paraphrasing from the Ball Canning guide: To check the lids for seal, the lids should not flex when pressed in the center. Remove bands. Try to lift the lids off with your fingertips. If a lid can’t be lifted off, the lid has a good seal. Replace bands. *Tip: To get the most juice from your lemon, roll it around on a flat surface with the palm of your hand before juicing to release more juice.